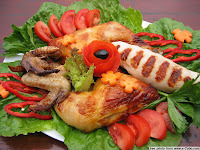 Food is one of the great pleasures of Bulgarian lifestyle. 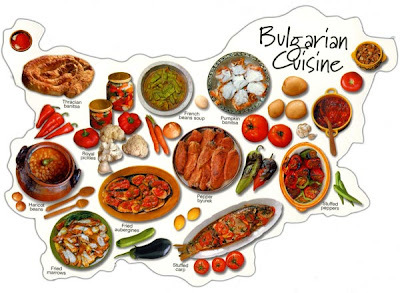 Bulgaria's cuisine is influenced by its neighboring Balkan countries - Serbia, Greece and northern Turkey. 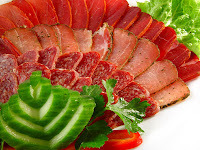 Traditional food includes Bulgarian bread, pickled vegetables, salads, soups, stuffed vegetables, kebabs, spicy sausages and cheese dishes. Add to this, lots of garlic, onions, oil and spices. Vegetables include aubergines, beans, cabbage, carrots, corn, courgettes, cucumbers, peppers, potatoes, tomatoes, zucchini, pumpkin, onions (yellow and green), peas, celery, spinach, cauliflower, lima beans, lettuce, radishes, turnip, gumbo, mushrooms and olives. Meats are pork, beef, lamb, chicken and fish. Fruits are cherries, raspberries, strawberries, blueberries, blackberries, apples, peaches, pears, plums, apricots, watermelons, melons, grapes, quinces, medlars. Banitsa- flaky dough and cheese pastry, sometimes with spinach, leek or onion. Kozu'nak- bread-like, with sugar spread on top. Very good with yoghurt. Bo'za- made from millet and tastes like puffed wheat cereal, in a brown liquid form. Looks like chocolate milk, so it's better to check what it is before buying it. 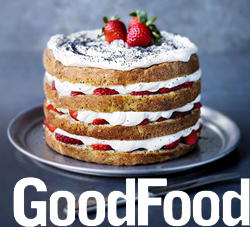 According to veteran expatriates, it is best with a shot of vodka or whisky added to it. Bulgarians always start the meal with a salad (sa'lata). Shopska salad - chopped tomatoes, cucumbers, fresh or baked peppers,onion and white cheese (sirene). 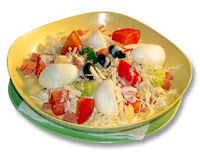 Ovcharska salad (Shepherd`s) - chopped tomatoes, cucumbers, fresh or baked peppers,onion and white cheese (sirene), grated egg, mushrooms, and occasionally ham. 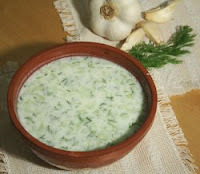 Snezhanka - chopped cucumbers with garlic in strained yogurt. Russian salad- small chunks of potatoes, carrots, peas, sausages, grated egg with mayonnaise. 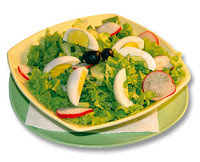 Green salad - salad lettuce, cucumbers, radishes, onion, egg, olive. 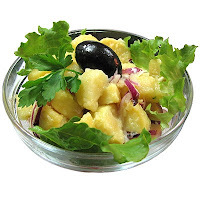 Kartofi salad- boiled potatoes, onion, lemon or vinegar, olive. Roasted peppers salad - salad with peppers, garlic, olive, lemon. Kyopolou - roasted aubergines, peppers, tomatoes, loads of garlic, parsley. Dried sausages called salami - lunkanka, pasturma. Olives and white or yellow cheese. 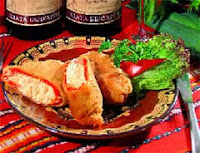 Chushki byurek - a pepper stuffed with cheese and herbs and fried in breadcrumbs. 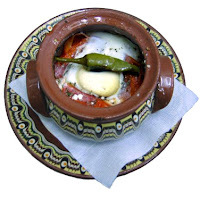 Sirene po Shopski - white cheese baked in a clay pot with an egg and a pepper on top. Roasted peppers with tomato sauce. 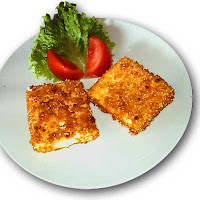 Kashkaval or Sirene pane - fried yellow or white cheese. Fried brains, liver or chicken hearts. Pileshka supa - chicken soup. 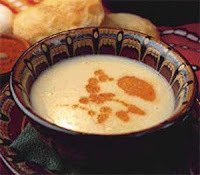 Bob chorba - traditional bean soup with plenty of herbs. Tarator - cold yougurt with cucumbers. Parzhola - chicken or pork chops, served with french fries. 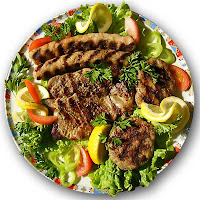 Shishche - kebab, pork or beef. Kyufte - spicy meat balls, pork or beef. Kebapche- same as kyufte but in sausage form. Musaka - potatoes and minced meat, egg, yoghurt. Sarmi - filled peppers with minced meat and rice. Gyuvetch - stewed chunks of vegetables and lamb. 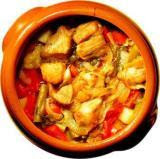 Kavarma - meat and vegetable stew, usually served in individual pots. Palachinka - pancakes with honey and nuts. Baklava - pastry filled with nuts and soaked in sugar syrup. Tulumbi - fried dough sticks in syrup. Beer- preferred Bulgarian beers are Zagorka, Kamenitza, Ariana. Wine- this is high quality and low in price. Wines from Preslav, Novi Pazar, Suhin Dol, Melnik and Khan Krum (Shoumen Region) are considered to be the best. Sungularski Misket (dry white) is a very popular wine. Rakia- Bulgarian fruit brandy, often made of plumb or grapes. It is the national drink and rather strong. Rakia is said to cure stomach pains, cancer and hangovers.